The redwood lined Avenue of the Giants. The Avenue of the Giants is a 31.5 mile scenic highway lined with towering old growth redwoods that runs along Northern California's Eel River. The southern entrance is located just south of Garberville (roughly 4 hours north of San Francisco). The river basin provides ideal growing conditions for the giant old growth redwoods which have grown to become some of the tallest in the world many larger than a 30-story building. Old Growth Redwoods just off the highway. 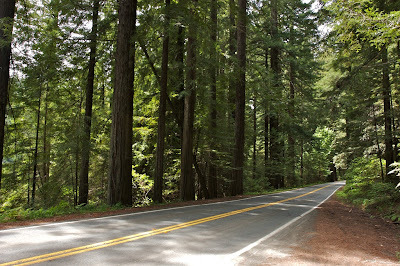 The highway is dotted with numerous turnouts and signed redwood groves. The founders grove found near the north end of the drive was home to what were previously believed to be the worlds tallest trees. While that crown has been shifted to an unknown tree on a non-descript hillside in Redwood National Park, the Avenue trees are non-the-less impressive. The south fork of the Eel River. 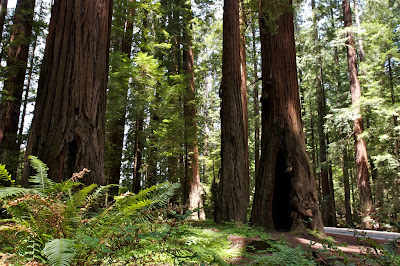 Stephen's Grove represents one of the southern redwood groves on the drive. 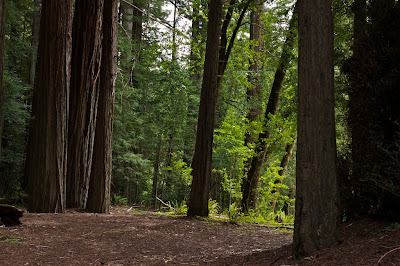 A short walk near the highway under the cathedral like canopy of the redwoods is almost overwhelming. The occasional, and inescapable, roar of cars along the road is distracting however. Only the carpet of the clover-like redwood sorrell and lush ferns and the trail itself provide any sense of scale among the giants. 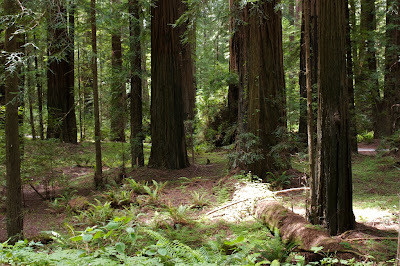 Our first taste of this giant and primeval forest only wet our appetite for more redwoods. So we continued driving north. Old Growth Redwoods & Redwood Sorrell. 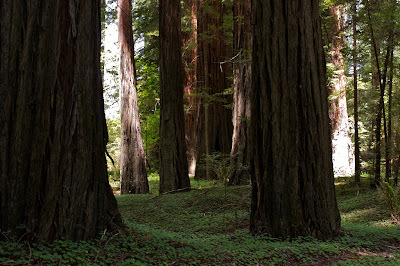 A turnoff at the unimpressively named "California Federation of Womens Club's Grove" provides access to the most impressive redwoods in the park. A short but squirly drive deeper into the forest towards the deep green Eel river provides some separation from much of the traffic along the Avenue of the Giants. 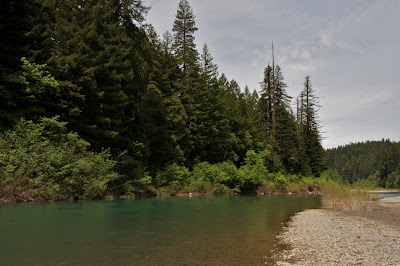 Across the river lies the Bull Creek area, reportedly some of the most beautiful redwoods in this area. The simple trails running through the Womens Club's Grove however are beautiful enough if the summer footbridge is down. After about 20 minutes of Oooh'ing and Ahh'ing we departed for our next destination The Founders Grove before finally getting back on 101 N to continue our trip up the state.